The government and parliament enjoy unparalleled levels of confidence; banks and churches have improved their reputations. On the other hand, trade unions and employer organizations are losing credibility. The Federal Supreme Court has topped the trust ranking for the seventh time over the last ten years. 68 percent (+6 percentage points since 2014) of Swiss people have the utmost confidence in the Supreme Court in Lausanne. Last year's top ranked institution, the Swiss National Bank, was downgraded, possibly as a result of the scrapping of the Swiss franc cap against the euro, sliding down to eighth place with 52 percent (–12 percentage points). The police, which last topped the rankings list in 2012, managed to hold on to last year's third place with 57 percent (–3 percentage points). Those surveyed feel – as they do about the Federal Supreme Court – that they can rely on the police. The national government is the big winner, steadily rebuilding its basis of trust among the people from its low point in 2003 (37 percent). The Federal Council took second place for the first time ever with 63 percent (+6 percentage points). Other governments can only dream of trust levels this high (in similar surveys conducted in Germany and Austria, fewer than 50 percent have confidence in their respective government). Even the Swiss Federal Assembly was able to maintain a high level of voter confidence, the National Council ranking third with 57 percent (+1 percentage point) and the Council of States seventh, holding steady at 55 percent. The political parties have achieved an increase in confidence to 46 percent (+4 percentage points), coming close to the administration (49 percent, –1 percentage point). 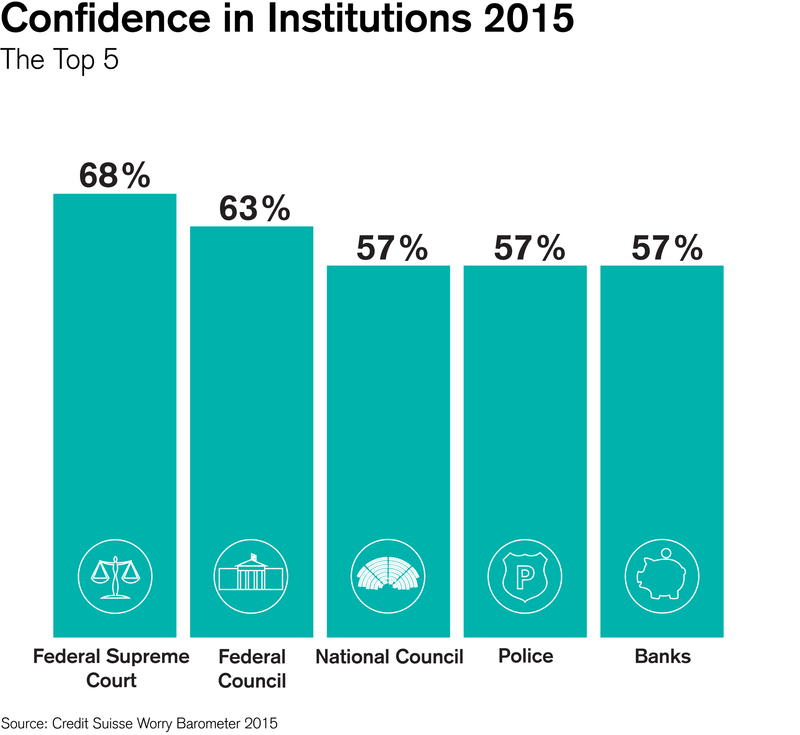 Banks saw the biggest rise in trust levels, up +11 percentage points within a single year to reach 57 percent, putting them in a three-way tie for third place with the police and the Federal Council. Unlike the dot-com crisis, which led to a low of 33 percent in 2001, in the eyes of the Swiss, the banks have weathered the financial crisis extremely well. Churches gained in popularity during this time of uncertainty, managing to continually build on the population's confidence since 2008 (36 percent), even gaining 10 percentage points this year to reach 56 percent. At 51 percent (+1 percentage point), the armed forces also still enjoy the trust of a majority of the population. NGOs, included in the survey for the first time, were unable to pass this threshold (47 percent). This also holds true for the EU, which, after gaining 5 percentage points, achieved its highest ranking to date of 42 percent, a somewhat surprising result in light of the refugee crisis and the financial crisis in Greece (the long-term average is 29 percent). 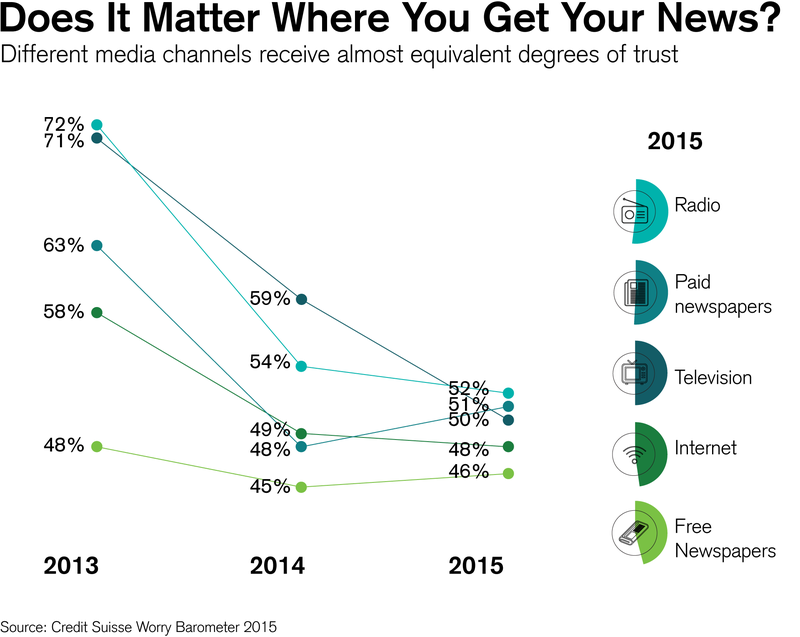 The media comparison shows the winner to be radio with 52 percent (–2 percentage points), but only because television experienced an even greater loss of confidence, reaching its lowest value to date of 50 percent (–9 percentage points). Paid newspapers not only gained trust (51 percent, +3 percentage points), but were also able to surpass free newspapers (46 percent, –3 percentage points). The internet also managed to gain credibility (48 percent, +3 percentage points). Employee organizations (–9 percentage points to 47 percent) and employer organizations (–15 percentage points to 38 percent) saw their trust ranking collapse which is a result both dramatic and difficult to interpret. One explanation could be the charges leveled at representatives from the business community that, in tough times, they do too little in the interest of the common good. Despite that, as of last year, 65 percent of those surveyed still held the opinion that business leaders never (14 percent) or only seldom (51 percent) failed in crucial respects. The last time business leaders achieved figures this high was in 2000. When it comes to Switzerland's strengths, political characteristics are at the forefront, mainly neutrality at 48 percent (+15 percentage points), education at 32 percent (–6 percentage points), peace at 30 percent (+2 percentage points) and coexistence of cultures at 29 percent (–2 percentage points). Only then does Swiss quality follow as the strongest economic aspect at 28 percent (+4 percentage points). Between 2006 and 2011, this term always ranked in first or second place, peaking with figures up to 50 percent. Last year's results were improved somewhat, which holds true for most other sectors as well: the pharmaceutical industry gained +6 percentage points to reach 25 percent, the financial center +9 percentage points to 22 percent, the watch industry +1 percentage point to 18 percent and agriculture +3 percentage points to 15 percent. Only the healthcare industry (24 percent, –2 percentage points) and tourism (17 percent, –2 percentage points) fell in the ranking. The fact that only 16 percent (–1 percentage point) of those surveyed referenced a generally strong economy as one of the country's main strengths highlights the currently ambivalent attitude toward the economy.